are as strong as ever. 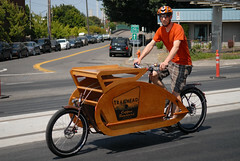 In Portland, bikes go with just about everything. Whether it’s beer, food, religion, fashion, business, or even opera – the ties that bind biking to this city run deep. High atop that list is the connection between bikes and coffee. Portland’s reputation for coffee is well known, so it’s no surprise that the two would come together. What is surprising, is how the relationship has blossomed over the years. Last week I caught up with three bike-centric local coffee purveyors. 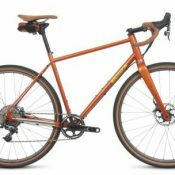 I wanted to see how their connection to bicycles had changed as their businesses have grown. In all three cases, I was pleasantly surprised. The first person I met up with was Charlie Wicker. Charlie, 41, is the man behind Trailhead Coffee Roasters. He sold his first bag of coffee in January 2009 (we profiled him a few months later) and since then he’s built up a solid clientele that includes New Seasons Market, Whole Foods, Cafe Velo and Florio Bakery. 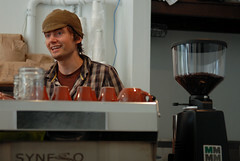 Earlier this month he opened the doors on a brand new roasting facility and headquarters at 1847 E. Burnside. At a party to celebrate the opening, he unveiled his new cafe bike, made in collaboration with Metrofiets (of HUB beer bike fame). Charlie’s new cafe bike is a big step up from the modified Xtracycle he used to ride. Metrofiets built him an extra-stiff frame with a slightly larger cockpit and longer wheelbase to accomodate Charlie’s needs. The color is a rich mix of light and dark brown (colors decided upon after a round of coffee at the paint shop, says Phillip Ross of Metrofiets). Charlie did all the gorgeous woodwork, which he’s very proud of. “I can ride up to a guy on a yacht or in a Jag and they’d say, ‘That’s cool! '” Upping the cool factor are integrated LED lights on the fins at the rear of the cargo box and a large tabletop where he can do his brewing and serving. For now, Charlie says he’s got no plans to open up a bricks and mortar location. “With the new roasting facility, I’ve got huge capacity… And running a cafe is a whole different beast.” In September, Charlie plans to ride his cafe bike in all 450 miles of Cycle Oregon, brewing fresh coffee along the way. days after opening Courier Coffee. 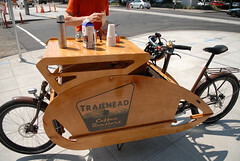 Another Portlander whose bike-based coffee business has taken off is Joel Domreis. I interviewed Joel back in April 2007, at the same location in downtown Portland where he now operates Courier Coffee (923 SW Oak, it used to be Half & Half Cafe). 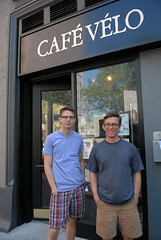 Joel opened his new cafe just one week ago, and already has a steady stream of business. Like Trailhead, Joel also built up a loyal following with this great tasting beans that he’d put into mason jars and deliver by bike to cafes and individual customers throughout the city. Joel was busy pulling shots and directing the action when I stopped by last week. I didn’t want to break his concentration with questions, but judging from his smiles and interactions with customers, he’s clearly enjoying the new challenge. The cafe is open Monday through Friday from 7:00 am to 5:00 pm. Just a few blocks from Joel’s new place is another cafe opened by someone who started their business on a bike. 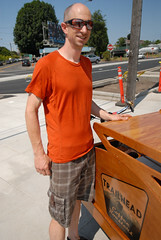 Rick Wilson was one of Portland’s earliest cargo bike adopters. His bakfiets blog caught my eye way back in October 2006 and in April 2008 he started Cafe Velo, Portland’s first bakfiets-based business. 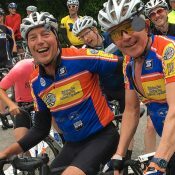 Today, Rick and his business partner Jeremy Robillard have moved way beyond a bike-based coffee business. Cafe Velo, known for their exquisite dripped-to-order coffee, is now nestled into a tiny space on the corner of SW 6th and Pine. The cafe serves gourmet sandwiches and baked goods to a morning and lunch crowd of business professionals who stream out of nearby high-rise office buildings. With bike lockers, a fountain, lots of offices, and a MAX line right outside the door, Cafe Velo’s location couldn’t be better. Rick says the small space serves his business model perfectly. “I’m always trying to do more with less, so this space appealed to me… And I don’t have any extra storage space anyways.” Cafe Velo still does about 90% of their supply runs with their trusty old bakfiets and they serve coffee from it to hordes of people at the PSU Farmers Market on Saturdays. Cafe Velo was featured prominently in this last Sunday’s episode of Leverage filmed downtown Portland in the north park blocks. The barista was spiking cups of coffee with sleeping pills being sold to the cops. I was one of the cops. Yikes! Man, I love Charlie’s Cafe Bike. It’s a thing of beauty and looks like a blast to ride. 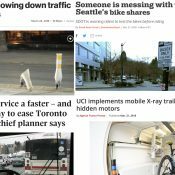 « Want to trade your car for a custom bike? 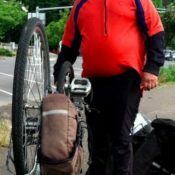 Tour de Fat needs you!